In my research last night I forgot about the full moon tomorrow night and the potential implication for next week and a possible correction. Given that the last new moon was a reversion incident and it continued to push higher into resistance and subsequently past resistance, the likelihood of a pullback next week is on the table. I’m seeing the most weakness in the TSX from my proprietary indicators that suggest that will be the first of the major indexes I follow to correct. I also feel confident it will be contained, shallow, and a great opportunity to add to existing long trades. When you look at the vertical move we’ve had on the DJIA (above), it’s an easy call to say “we’re due for a pullback” but that doesn’t mean it’s going to happen. A sideways correction is also a possibility. That’s why it’s important not to unload all your longs here. As I said in last nights video, it’s a stock pickers market so follow your trading rules per individual names and if you are trading the indexes it probably wouldn’t be a bad idea to trim some of those long trades and add on pullbacks. Good note Jeff, but I am afraid for traders, we should be a bit extra prudent in the face of a straight-up-rally like this and take profits, add shorts and sit on sidelines. 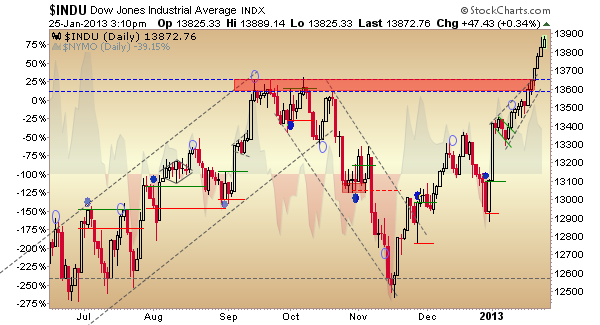 My guess is a selloff within a few days and let the fear permeate a bit before start to add to our longterm positions. Not sure if we are agreeing or not, but it feels like a buy the dip from you versus add to short side here from me. I doubt its just a consolidation – I think we take a punch or two on downside for the right-now-trade. Appreciate your thoughts on this since this is a big move – in either direction. I think we’re both on the same page. Markets will go sideways or down and any dips are buying opportunities. The market can continue to grind higher, but I am not sure that we can have really more than 1520 on the S&P 500 for now and we will visiting the 1575 at the end of the year. Thanks Jeff, Thinksmart. I was thinking 1520-1525 as well, if that. Its definitely hard to be early and get short and wait, but I think it is worth it. I might be a bit aggressive in shorting after weakness starts as well, but I think fear will overtake greed in the short term. That said, I am entirely in agreement that for longer term names that we like, its time to buy those dips. But slowly.